Why is Classroom Layout Important? Why Choose a Classroom Activity Mat? We Love Role Play Panels! We Love the Bubblegum Book House! School Places - Is Your Child Starting School in September? Why Use Display Boards in School? 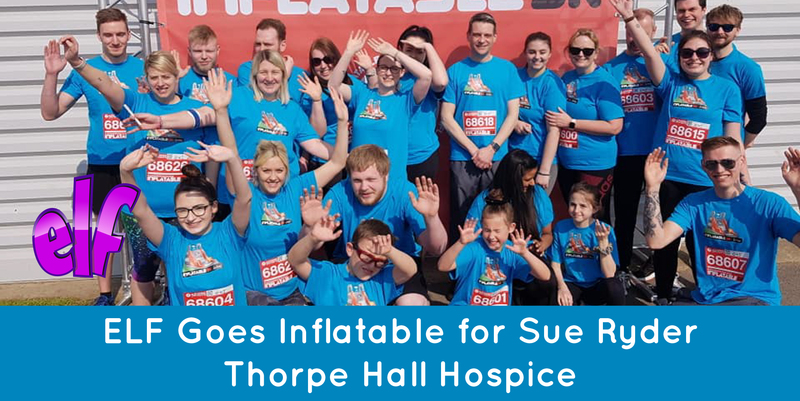 On Saturday 30th March, the team at Early Learning Furniture took part in Peterborough’s Inflatable 5k Run and raised a total of £689 for Sue Ryder Thorpe Hall Hospice. Twenty-six members from the ELF team put on their running shoes in a bid to raise as much money as possible for the local hospice. Our target donation was £500 and so we are delighted to have raised a total of £689 for the charity. This is the third year #TeamELF has tackled the inflatable obstacle course in an effort to raise money for the hospice. Thorpe Hall Hospice is the only specialist inpatient palliative care centre in Peterborough. The nurses look after terminally ill patients with complex medical needs and life limiting health conditions, as well as providing support such as bereavement counselling for patient's families. Thorpe Hall is a lifeline for so many families in and around Peterborough, but the exceptional care it offers comes at a cost. The hospice needs to raise £3.4 million per year solely through donations. That equates to roughly £9,000 a day just to keep running. The huge operating costs make charity partnerships like ours more important than ever; but we couldn't make the difference we do without donations from people in the local community. We would like to say a huge thank you to everyone who has dug deep and sponsored the ELF team. We couldn’t be more grateful to have received the support we have done to help us raise as much as we have. 100% of all donations will go directly to the hospice to help it continue to provide the essential care it does for so many of us here in Peterborough and the surrounding areas. We partnered with Sue Ryder Thorpe Hall Hospice back in 2017 and have been fundraising for them ever since. We have taken part in lots of runs, the Dragon Boat Race, office dress down days and more in order to raise money for the hospice. So far we have raised nearly £9000 for Thorpe Hall and look forward to raising even more money in the future. Next stop: Dragon Boat Race 2019!